I have been wanting a standing desk for a while now. I spend LONG hours sitting in one position hunched over a computer. It is starting to take a toll on my health as I imagine it would for many folks. It causes neck and back pain, swollen legs and just overall fatigue from sitting there hour after hour. In addition, it is a well-known fact that sedentary work can cause overall health problems. But, what can you do about it if that is your job? I have found the most wonderful solution with the FlexiSpot Standing Desk! Not only can it improve your health but it can increase your productivity! If there is something that can help me stay productivity while helping my health, I am all in! 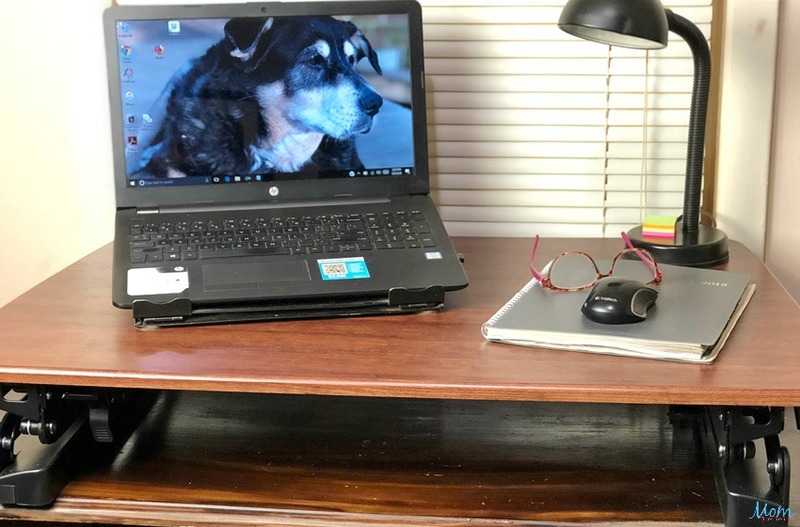 Now, I am anxious to tell you about my new favorite standing desk from FlexiSpot! 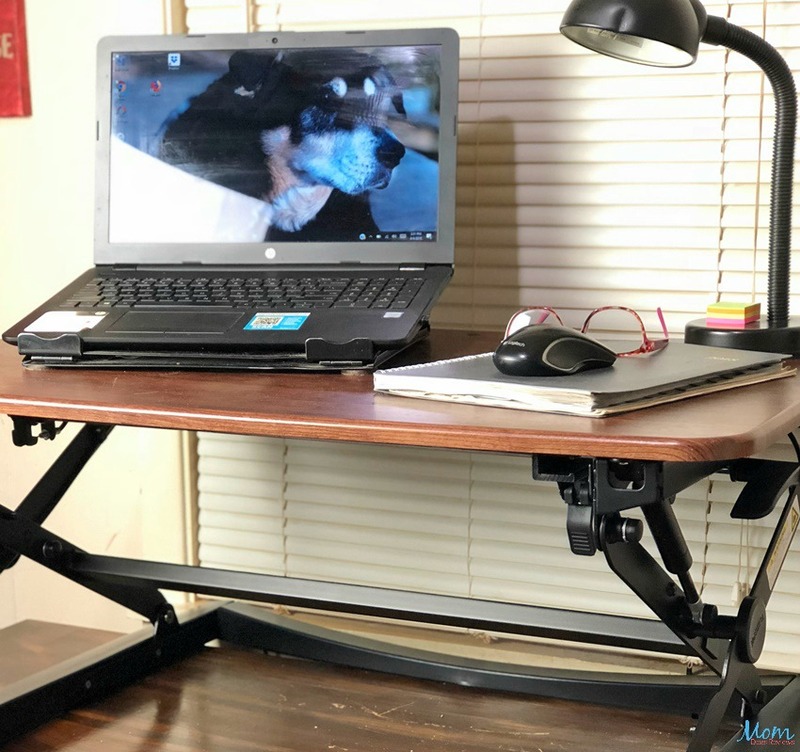 Before moving on, let me first introduce you to FlexiSpot and then tell you a few benefits you will reap by using a standing desk. At FlexiSpot, they believe there’s a healthier way to work. They’re passionate about transforming the conventional workspace into an active environment that supports wellness and productivity. Their commitment to wellness at work drives the design of every sit-stand workstation, height adjustable desk, exercise bike and ergonomic monitor mount they manufacture. 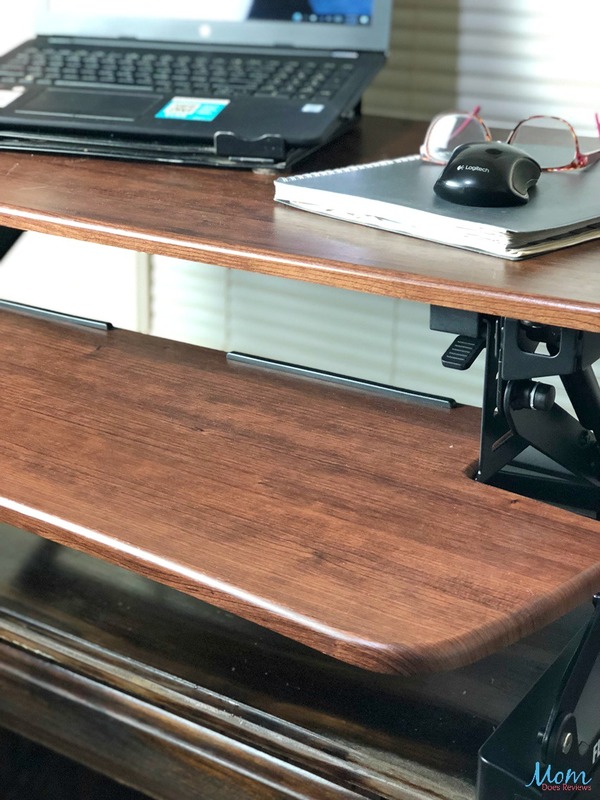 There are several benefits of using a standing desk like the FlexiSpot Standing Desk, including medical and productivity! Isn’t that something we are all in line for? You can burn more daily calories by standing to work AND boost productivity while reducing back and neck pain! And, it is no secret that sedentary work can lead to heart disease and diabetes. 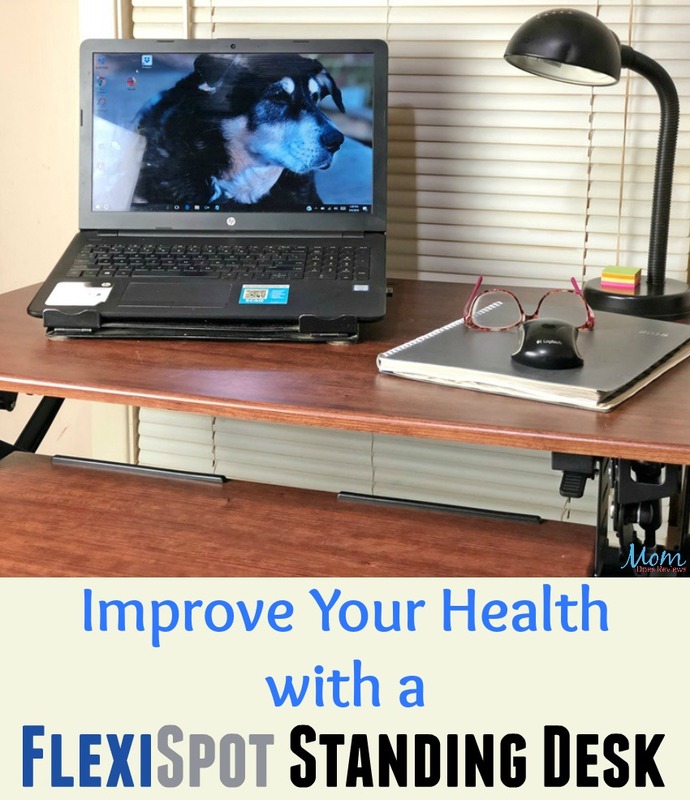 Using a standing desk is a lifestyle change that can benefit your overall health. That leads us to HOW standing to work can give you a boost in health benefits and how, specifically, the FlexiSpot Standing Desk can help! I am loving the FlexiSpot Classic Riser Workstation for its functionality. It is easy to transition from sitting to standing with the simple press of a lever! It also has plenty of space for all your “work things” and can be used with, or without, a keyboard tray. I love this feature as most of the time I work on a laptop. I can easily slip the keyboard tray off and store it out of the way. I love how easy it is to go from sitting to standing or back to sitting again. All it takes is a light squeeze of the hand bars. You can lower or raise the workstation with minimal effort even with the maximum load. 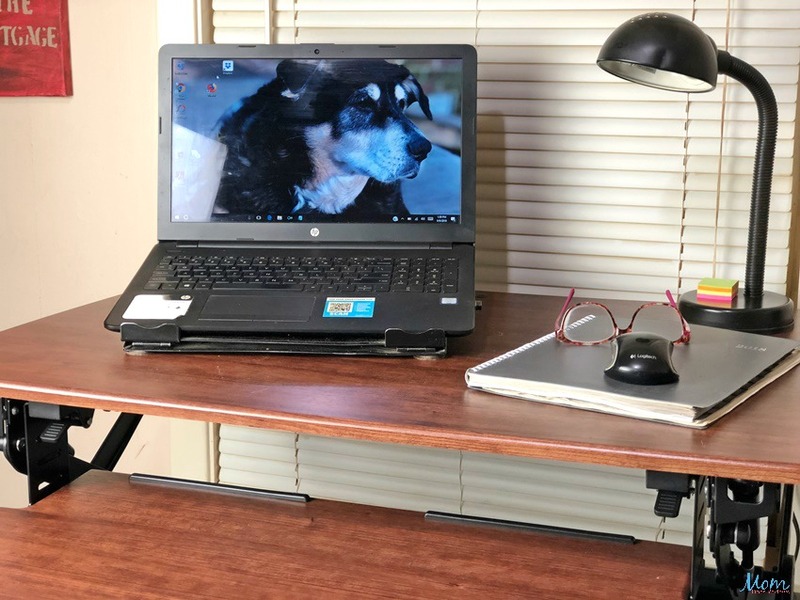 When raising the fully-loaded desk (35 lbs is the maximum weight capacity), you need 13 lbs of force to lift it up and only 3 lbs to take it down. That little voice in your head from your mother to sit or stand up straight haunts your memory, right? The correct posture helps your overall wellbeing. 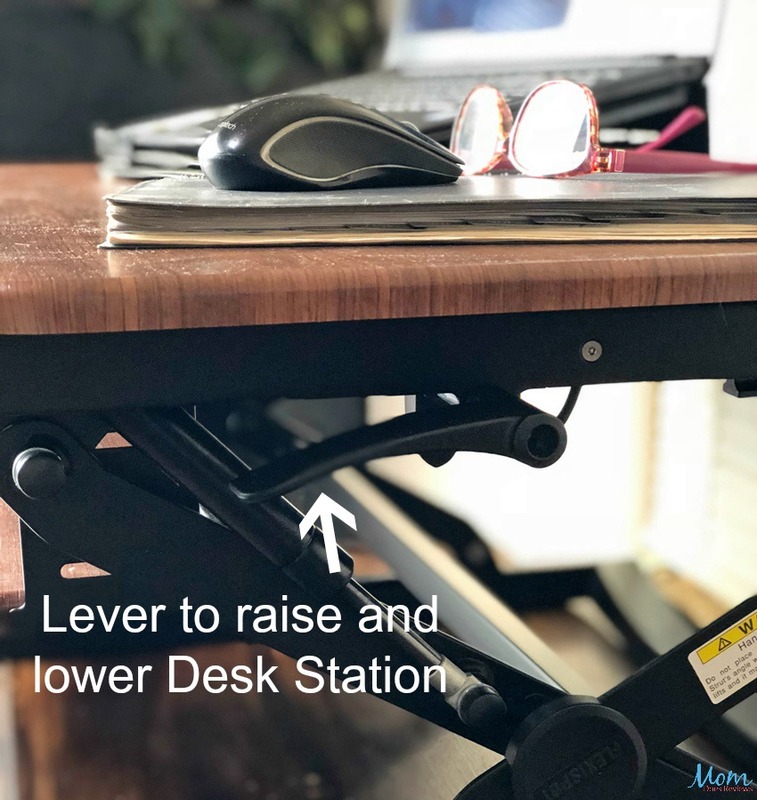 Well, every detail of the FlexiSpot standing desk riser is designed to help you maintain a comfortable and ergonomically correct position – whether standing up or sitting down! The FlexiSpot Classic Riser Workstation provides a more comfortable reading distance as well as more surface area. There is ample room for your monitor, laptop, tablet, paperwork, and more. 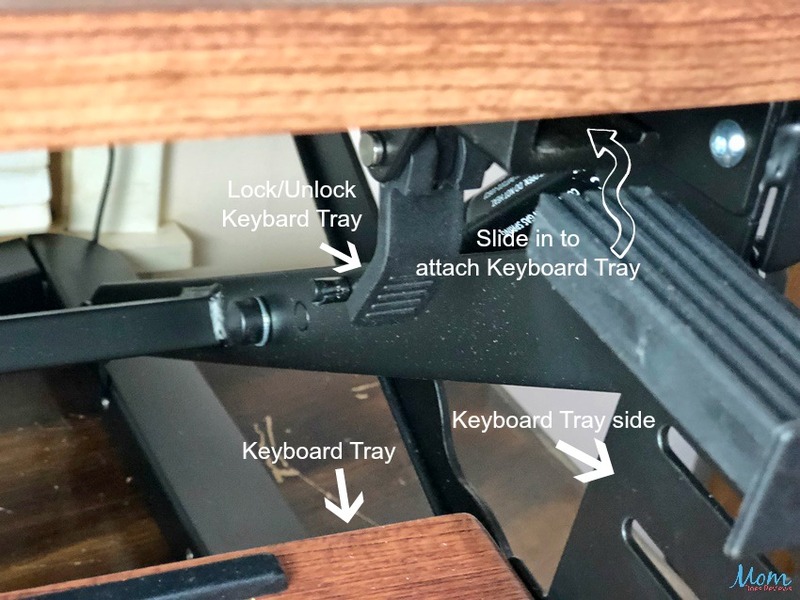 Attaching the keyboard tray is quick and easy. Simple unlock the tabs on both side and slide the tray ends into the slot. Lock the tabs and you’re done. It is simple as that. You will love the depth of the keyboard tray. It offers plenty of space for a full-sized keyboard, mouse, and mousepad while also providing adequate room for healthy wrist positioning. I love how the FlexiSpot rises and lowers vertically! This saves you valuable space in your workstation and offering better stabilization when raising and lowering. Other comparable desk risers extend outward when raising causing them to take up more room. My desk is old and not very wide, causing my desk riser to hang off slightly in the back. However, it is still very stable. Just keep in mind that you should always make sure of the stability. If you get ready to sit and work, lowering the FlexiSpot Workstation is super easy! Simply press the lever and push down. Now, you can have a seat and keep right on working! The FlexiSpot ClassicRiser Workstation will fit most people’s height. I am truly enjoying my FlexiSpot ClassicRiser! It has certainly met my expectations! With my long hours at the computer, it has helped me to be able to stand and work for periods throughout the day. My neck and back don’t bother me as bad and that infernal leg swelling I get from sitting too much has pretty much disappeared! It gets an A+ for helping with physical aches and pain. 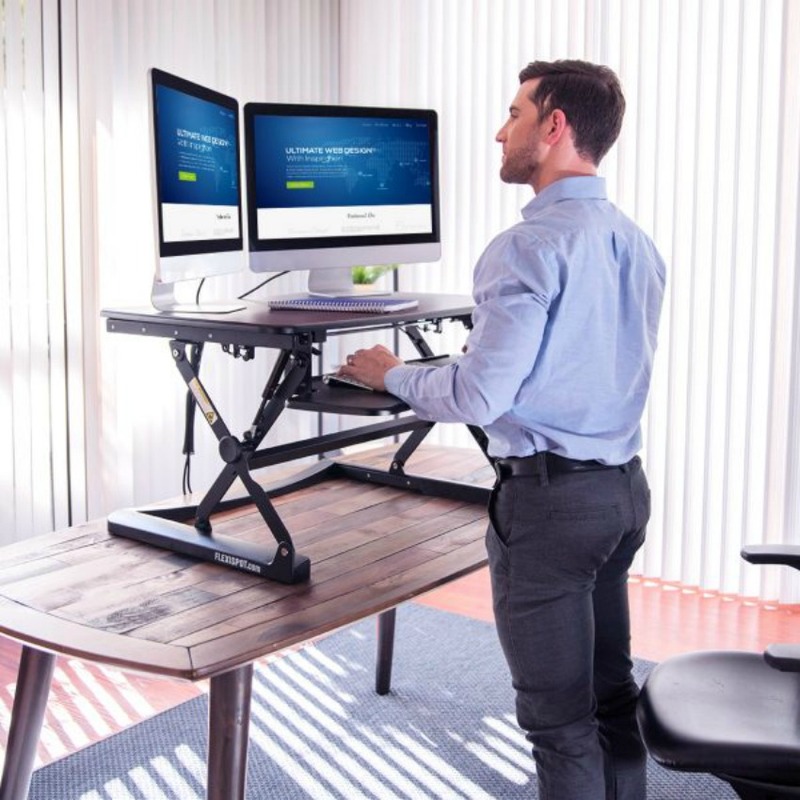 The FlexiSpot Standing Desk has also helped with productivity. While I do spend long hours on the computer, I don’t seem to feel as fatigued. This, in turn, helps me be more focused and accomplish more. Finally, as someone who already has heart-related issues, I am very aware that sitting all day is not helping it. I am loving the lifestyle change of standing while I work. Then, of course, if I need to sit a while it as simple as the press of a lever. Are you ready for a healthier more productive workspace? Visit FlexiSpot for more information and check out the FlexiSpot ClassicRiser! It comes in a few sizes and colors. I have the 35 inch River Walnut color. It also comes in 27-inch, 47-inch, and there is a 41-inch corner option. In addition to the River Walnut, it also comes in Black and Mahogany colors. We have added the FlexiSpot Standing Desk to our Mega Christmas Gift Guide!